Every home in Huntsville and Madison County has hazardous products that need to be disposed of safely. These items can be hazardous to the environment, animals and our families when they are disposed of improperly. The goal of the Household Hazardous Waste program is to reduce the toxicity of the community’s waste stream by removing as much of the household hazardous wastes as possible. By achieving this goal, the program is reducing injuries to waste-handling personnel; lessening the risks of injuries to fire and rescue personnel due to improper storage of hazardous waste in homes; decreasing air, ground and water pollution, as well as the contamination to our local sewage treatment plants and storm drains. The program is free of charge to all residents of Madison County, the City of Huntsville, and the City of Madison. Businesses may call 256-880-6054 concerning the Conditionally Exempt Small Quantity Generator Program and business disposal of hazardous waste. 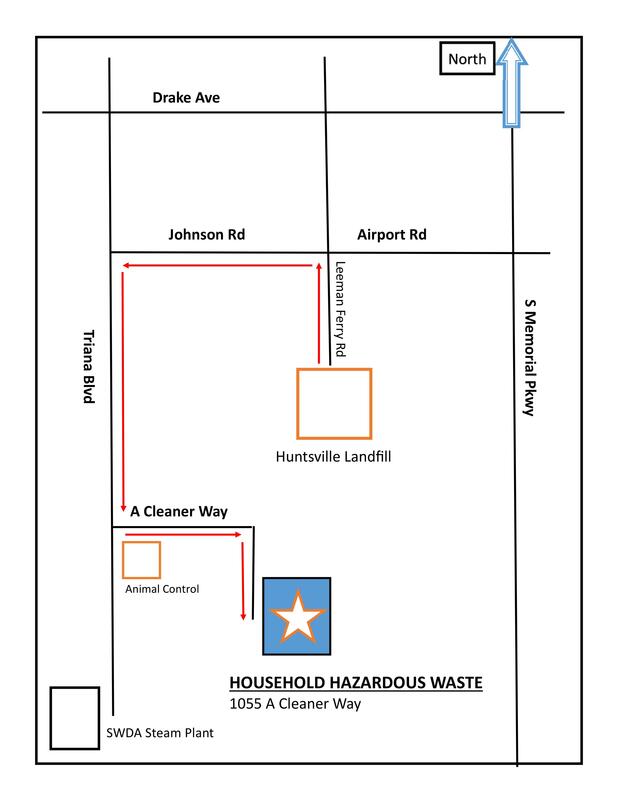 You can drop off household hazardous waste on Monday – Friday from 7:00 a.m. to 5:00 p.m. at the new drive-through Handle with Care Collection Center located at 1055 A Cleaner Way, Huntsville. Click here to see a map to the new location. For special assistance, call 256-882-0155. The HHW program is hosting off‐site collection events throughout the year. household garbage can for curbside pickup. We can not accept explosives, radioactive or biological waste. Household Hazardous Waste Program at 256-880-6054. Please try to bring household hazardous wastes in their original containers. However, if these containers are damaged please put them in a box that has been lined with two garbage bags or in a container with a lid. If your household wastes are leaking, put the box or container in cat litter, sawdust or other similar absorbent materials. Only purchase the amount of product you will use in a reasonable period of time. When buying paint, insecticides or pesticides, figure the area you will be working with, then check the product label for coverage instructions. Use all of the product according to the instructions on the label. Rinse the empty container three times before disposing of it in your regular household trash. See if your neighbors or local organizations can use any excess product you may have left over. Become a label reader. Just as consumers are becoming more environmentally conscious, so are the manufacturers. Try to purchase environmentally friendly products.